While the sport of skeleton pre-dates that of bobsleigh, it only really came back into the spotlight with its reappearance in the 2002 Olympic Winter Games in Salt Lake City, after a 54-year hiatus. Men and women compete seperately, with both disciplines aiming to first accelerate the sleds from a standing start, then jump on to their stomachs, headfirst, and navigate down an iced track, reaching speeds nearing 145 kph. 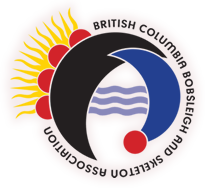 If you are interested in sliding as a Skeleton athlete with BCBSA, you will need to take the steps as listed in the Athlete Pathway. BCBSA offers the follow on ice programs under each stage. Drop in for a 2 hour introductory Skeleton School at the Whistler Sliding Centre. No previous sliding experience required! In this school you will be taught the core skills & techniques needed to get on the ice on a skeleton sled for the very first time. After a 30 minute safety orientation, participants will join the coach on a track walk to discuss sliding techniques, before being set up with a skeleton sled for the on ice portion of the school.Participants will then begin their on ice experience, starting from the Maple Leaf start (Corner 11 out of 16) and reaching speeds of up to 100km/hr. Once at the finish line, participant will carry their sleds back to the start for their subsequent runs.After the session the coach will debrief each athlete, and discuss the next steps for anyone with the interest to continue sliding. This session is open to anyone with a passion or an interest to try skeleton for the first time, with no commitment to continue. If you have completed a Talent Id and recieved an invte to a multiday school, you are not required to participate in the discover program. We ask that all participants are physically fit, and able to lift 65lbs. It is not recommended for anyone with a previous neck or back injury. Cost: $100 ($75 local*). Our local rate refers to full time residents of the sea to sky corridor and Metro & Greater Vancouver areas. We require proof of address upon arrival as confirmation of eligibility. Once payment has been processed, you will receive a receipt of purchase followed by some registration documents to complete. In this two day school participants will be guided by a professional coach as they learn the essential skills and techniques required for steering a skeleton sled. Athletes will continue to build sliding run volume from the Maple Leaf start (Curve 11), learning and progressing their steering technique over the course of the school. Athletes will slide in these schools at their own pace until the coach can sign them off to slide from Curve 7. At this point they may move to Stage 3. Cost: $270 ($170 for discover participants). Registration: Registration: Advanced registration for the program is required. To register please email executive@slidebc.ca. From here you will be contacted regarding schedule and payment.